Starting the trip from Valhall gives the best value for money. Of course we can pick up people from Harstad in the RIB and continue out to the archipelago for an exciting adventure, but this is more a case of transportation where we would rather recommend the express boat from Harstad to Krøttøy. There are several departures daily. You can then be met at the quayside at Krøttøy. There we are in the worlds northernmost populated archipelago where a sea of adventures await. Steine: Steine (Steinavær) was a well known fishing village for many years until 1912 when the last resident left the island. Now you can leave Valhall in an RIB and head north up Andfjord to visit the area in less than half an hour. Today you can clearly see the foundations of the houses and how small they were. These buildings often housed parents and children and the grandparents too. Today nobody can imagine having to live in such cramped conditions, but in those days it was more a case of survival. At best, 127 people lived here earning a living from fish and possibly a few animals for personal use. Large sailboats came all the way from Bergen to buy dried fish, salted fish and cod liver oil that was produced here. At its busiest around 250 people were employed here during the season. In 1890/)91, a windy breakwater was built towards the north between 2 islands giving shelter from the hard waves which often battered the harbour tossing boats out to sea. Take a trip and experience how people and nature lived as one. Valhall offers guided tours. Seals: In the archipelago there is a large family of seals, over 60 of them. They have been here for many years and their number is continually increasing. The easy access to plenty of food has ensured that this colony of seals is growing fast. During the summer most of the seals leave to go further out to sea where the females give birth to their young. They feel safe here away from people and boats. Seals in the archipelago are often nosy so it is easy to get close to them. Valhall takes you out on a boat to see the seals where they belong. Yttersteine. Yttersteine lies just to the west of Steine and is today in the ownership of the state. The area has never been settled but has been valuable due to the very hard stone found here. The breakwater to the harbour at Andenes is built from stone blasted out here and shipped from Yttersteine. Today huge colonies of birds have taken over. Cormorants, grey geese, several types of seagull and sea eagle and many more, nest here. In addition there are many otters and different kinds of seal to be seen here, especially during the winter. The density and great variety of birds make the islands really exciting. There the huge sea eagle rules at the top of the food chain. Trips on the RIB from Valhall are pure nature experiences that offer several interesting stops where you are guided and places where it is possible to go ashore for a bite to eat out in the open. RIB stands for ‘rigid inflatable boat’.Valhall has one that is licensed for 12 passengers. 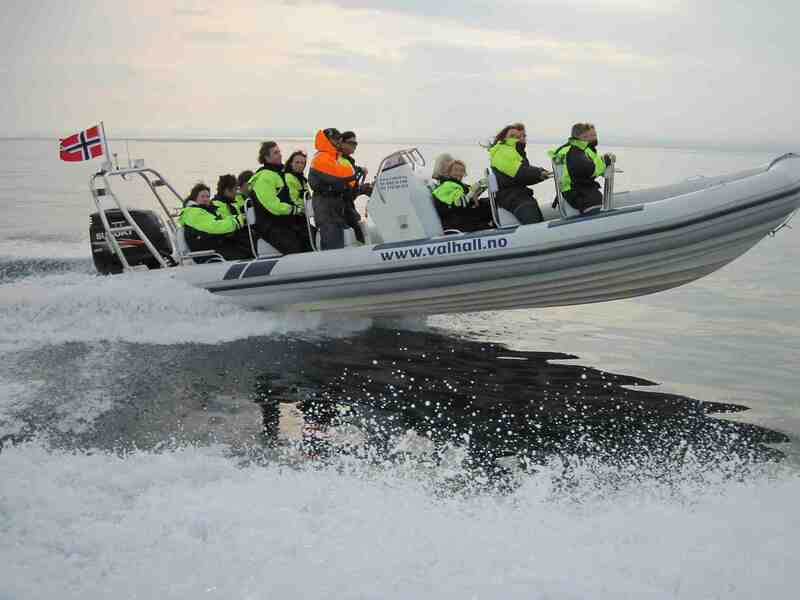 It has a 300hp engine and can reach a speed of 50 nautical mph.Price for RIB is 8900kr, per hour. Price example for return trip to Steinavær from Krøttøy/Valhall inclusive of guiding and stops, 890kr per person exclusive of food. Price for groups of 8-12 people. Duration 1-2hours. Contact us for prices for smaller groups or lone visitors. Join our Facebook groupBook now!Book now!